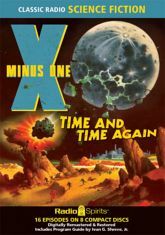 Launch your imagination, and break the bonds of time and space, with radio's highly-acclaimed science-fiction anthology X Minus One! Produced in cooperation with science fiction magazines of the day, the series featured provocative stories by the genre's top genre authors. Ray Bradbury, Ernest Kinoy, Robert Sheckley, and more helped Americans of the 1950s look to the future. Dramatized with an atmosphere of excitement, top radio voices like Raymond Edward Johnson, Les Damon, Staats Cotsworth, Ruby Dee, Mandel Kramer, Joe DeSantis, and Bill Lipton gave voice to their visionary tales. Includes 16 digitally restored and remastered episodes, and a Program Guide by Ivan G. Shreve, Jr.